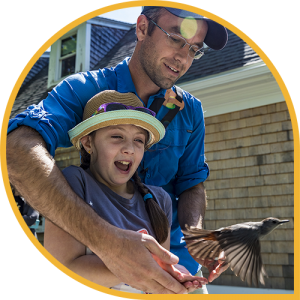 Since 1969, Manomet’s Landbird Conservation staff and bird banding interns have worked to provide people of all ages and levels of interest with an understanding of the natural world and how it is changing. From inviting local schools to visit the lab for a live demonstration, to bringing our research to classrooms, conferences, and partner stations across the world, Manomet’s reach has extended far beyond the town lines of Plymouth, Massachusetts. Spending time at the banding lab, whether for an hour or as a recurring visitor, can transform the way people think about nature. Bringing guests up close and personal with birds they may only have seen from afar and getting a small glimpse into their world creates an unforgettable experience. Learning about the delicate balance in how birds interact with their environment, and understanding the huge role we play in that balance, is a first step toward influencing people’s behavior and sparking interest to get outside to experience more.